In D101 we spend much time in the Bible, but is more than a Bible study. We will look at the birth of the church and its early roots and what it has evolved into, but it is not a lecture on the church. D101 is time spent together in a small group where we will share life, take an honest look at “church” and all the “baggage” the word contains. We will share the Lord’s Supper, read Scriptures, discuss, vision, role play, and pray together. Our time together will be spent both gathered inside and hands-on out in our community doing various exercises such as prayer walking. We will discern the core of our calling to return to and form simple churches that Love God, Love our Neighbor, and make Disciples who make Disciples. It meets for 9 straight weeks, once a week for 2 hours. Please check are events page, or contact us for information on current and upcoming D101 trainings or if you wish to have a training out on in your church or group. Team Expansion, a ministry with a kindred heart and desire to make disciples put together this amazing 30 day challenge that flows out of the same material in our Discipleship 101 Training. 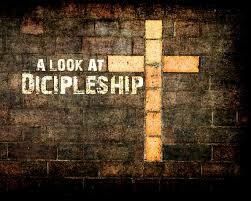 Do you dare to be a Disciple? There is no curriculum, workbook or training involved. There is no leader needed in the group. A Band is the simplest form of spiritual community and provides ongoing accountability to learn, obey, and pass on spiritual truth. It incorporates the values of living a balanced spiritual life which results in the developmentand reproduction of disciples.